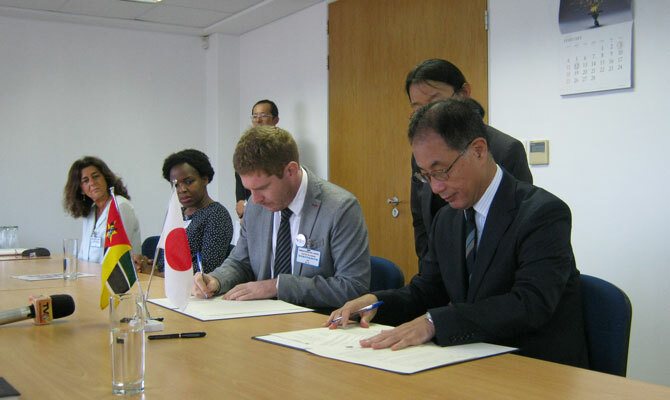 On Friday 16th February, Doctors with Africa CUAMM and the Japanese Embassy in Mozambique signed a collaboration agreement for the construction of two new SAAJs in Beira, Sofala Region. The new SAAJs will involve the Mascarenha and the Inhamizua Health Centres. “In the year of the 40th anniversary of CUAMM’s presence in Mozambique, we are signing a collaboration agreement between two Institutions that we hope to be the beginning of a shared journey. […] Thank you for supporting Doctors with Africa CUAMM activities in fighting HIV. With your contribution, we will scale up and strengthen the services dedicated to youth and adolescents health.” – Damiano Pizzol, CUAMM’s country representative of Doctors with Africa Cuamm in Mozambique, to the Japanese Ambassador Toshio Ikeda in Mozambique. SAAJs are independent friendly health services for young people and adolescents, aiming at educating them about safe health behaviors. They offer free counselling about reproductive and sexual health, prevention, test and treatment of HIV. SAAJs structure are designed to ensure that youth individuals receive services in privacy. This approach has proven to be effective in increasing the quality of the service and therefore the efficiency in dealing with a topic that is still surrounded by stigma and discrimination with the particularly fragile category of adolescents. The intervention not only represents a precious help to Beira population, but it is also a significant step towards the achievement of the UN 90-90-90 target to end AIDS epidemic by 2020. Based on this target, 90% of all people living with HIV will know their HIV status; 90% of all people with diagnosed HIV infection will receive sustained antiretroviral therapy; 90% of all people receiving antiretroviral therapy will have viral suppression.